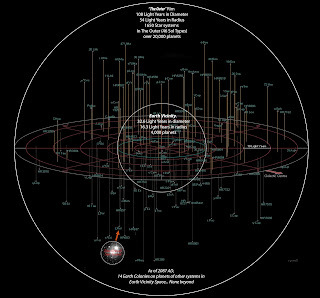 Alien Explorations: Alien: The galactic map of "Alien"
Alien: The galactic map of "Alien"
A diagram with the online script shows a starmap of the territories where humans have explored. 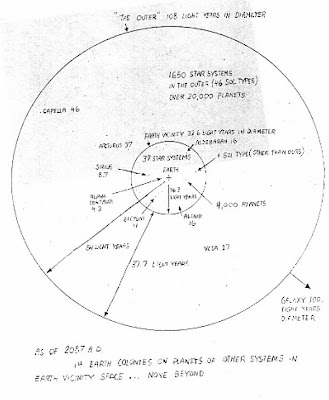 As we know the Nostromo in its return journey has not reached the rim of "The Outer" which is 108 light years in diameter, or 54 light years away from Earth, and the area is separate from the inner circle, Earth Vicinity which is an area around Earth , 32.6 light years in diameter which equals 10 parsecs (this has been a popular distance for people to make charts listing the stars within the area local to Earth in past years.) It contains 37 star systems and 4000 planets. 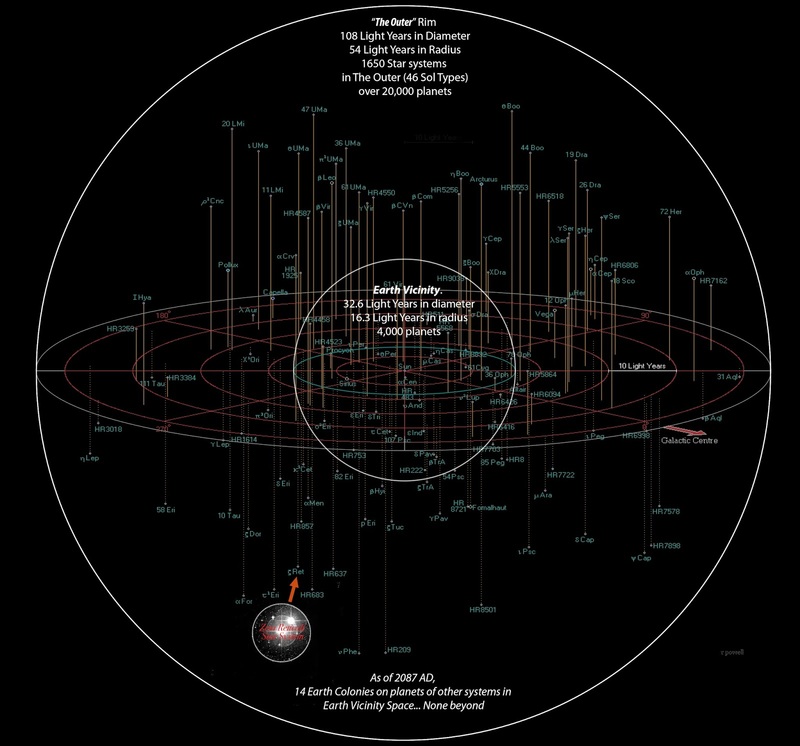 "The Outer" contains 1650 Star Systems, 46 like our sun, and over 20,000 planets. The distance from "The Outer" rim to Earth Vicinity's rim is 37.7 lightyears. 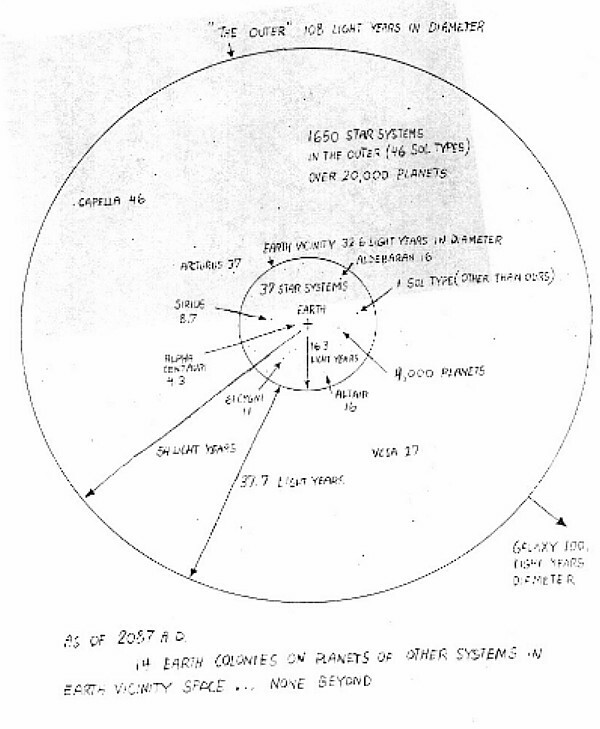 In Dan's original script, Roby suggests that they should "get on the radio to the exploration authorities", and with radio signals traveling at the speed of light Standard states that it will take 75 years to get a reply back. The questions here, might assume either he is saying that the exploration authorities will respond to them from the rim of Earth Vicinity or are they really near Zeta Reticuli and expect to send a signal to planet Earth directly? 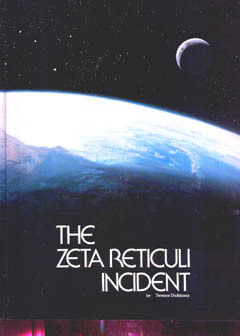 Incidently a TV movie about the Betty and Barney Hill abduction experience came out in 1975 called The UFO Incidence, starring James Earl Jones and this was from a time when not that many were known about. c) In O'Bannon's early draft and the revised final draft from June to October 1978, it was decided that where the source of the transmission being planetoid was to be found at Ascension: 6 minutes 32 seconds, Declination: -39 degrees 2 seconds. 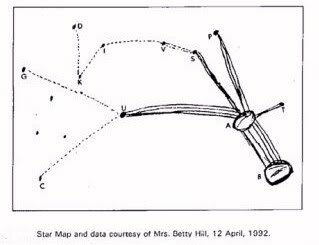 If we used that as coordinates looking at the sky from Earth, we find nothing there, although we find that it's between the areas of the constellation of the Phoenix and the sculptor. What might have been the idea behind the co-ordinates? Or was this supposed to be where it was in relation to the Nostromo with the ship at the centre?